Thomas Müntzer was more than a supporter of violence. Was Thomas Müntzer (ca. 1488-1525) an Anabaptist? He seems to have opposed infant baptism, yet it’s uncertain if he was rebaptized. In any case, he’s a figure from whom many modern Anabaptists disassociate themselves. But what do they do, then, with the prophet Amos and the apostle James, whose social concerns and words were equally strong (violence excepted)? There’s more to Müntzer than his support of violence. Look beneath it to his broader social concerns. His story reflects the social environment out of which Anabaptism emerged. Thomas Müntzer was from Saxony, a “bright, but undisciplined,” yet serious student at three universities who became a priest. By 1519 he was influenced by Martin Luther. He became a reformer and yet soon was sharply critical of Luther. Yes, he promoted the use of force, but not for its own sake. He wanted the Christian faith to be expressed partly through social justice. People were oppressed; social change was needed, he said. Müntzer “proclaimed that God would soon bring the present age of the world to an end, punishing those who oppressed the people.” In 1524 he preached a blunt sermon to Duke John of Saxony, his son, and court officials, “urging them to become God’s instruments in the revolution.” “Not surprisingly, they declined,” says William Placher. These powerful people could have punished Müntzer had they so chose. Yet he didn’t mince words. Such courage! Here’s a bit of his sermon: “… Perform a righteous judgment at God’s command! You have help enough for the purpose, for Christ is your Master. Therefore let not the evildoers live longer who make us turn away from God. . . God is your protection and he will teach you to fight against his foes. He will make your hands skilled in fighting and will also sustain you” (see Placher). 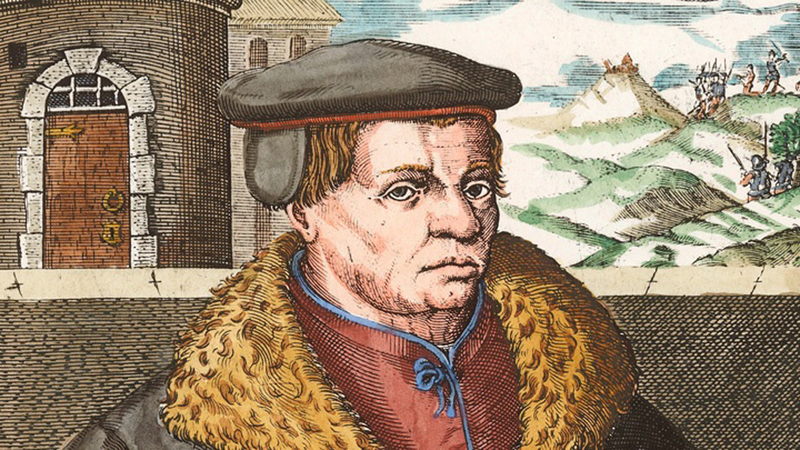 After that, Müntzer joined German peasants in their short-lived Peasant War (1524-1525). Captured at the Battle at Frankenhausen on May 15, 1525, he was tortured and imprisoned. He recanted and was executed (H. Hillerbrand). I’ve read that just as modern Anabaptists reject the violent legacy of Thomas Müntzer, some Lutherans today grapple with what Martin Luther wrote to German princes about the warring peasants: that the princes could kill them just as a person would kill an attacking mad dog. Luther had earlier, and still later, supported some of the peasants’ concerns, but this was overshadowed by his support of force against them. By alienating some of the peasants, he hurt the Reformation in some circles. We might ask what would have happened if Luther had been as forceful as Müntzer in challenging the princes to show their Christian convictions through social justice? At the same time, it’s important to realize that, as Dr. Robert Kolb shows, Luther did challenge rulers. No, these statements aren’t from the Twelve Articles of the Swabian Peasants. They are found within our EMC Constitution. Sources: C. S. Meyer, “Luther, Martin,” in Dictionary of the Christian Church, ed. J. D. Douglas (Zondervan, 1981); R. H. Bainton, Here I Stand: A Life of Martin Luther (Mentor, 1950); W. C. Placher, Readings in the History of Christian Theology, vol. 2 (WJK, 1988); H. J. Hillerbrand, ed., The Reformation (Baker, repr. 1987); “Müntzer, Thomas,” Wikipedia; “Battle of Frankenhausen,” Military Wiki; R. Friedmann and W. O. Packull, “Müntzer, Thomas” (GAMEO, 1956, 1987); “Thomas Müntzer,” New World Encyclopedia (2014); Robert Kolb, “Luther on Princes and Peasants,” Lutheran Quarterly (online in more than one form).